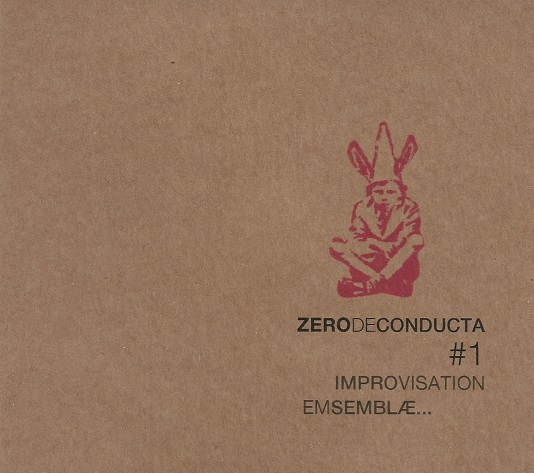 Zer0deConducta is a relatively new Barcelona six-piece, self-described as, “an improvised, experimental, electro-acoustic group” – a new project it might be, but it’s comprised of musicians and improvisers who’ve been around long enough to know what they’re doing. While the city’s free improv scene currently falls into two (very) broad halves – the non-idiomatic practitioners focused on pure sound and an often more minimalist ‘faction’ that tends to combine sound with visual arts (theatre, dance, performance, spontaneous painting/drawing)* – Zer0deConducta seem to be heading into different territory. Partly it’s their approach to creation which strikes me as stemming from more of a ‘jamming’ philosophy; i.e. not the kind of improvisation that seeks to avoid what has gone before but is happy to draw on the past to create something new. It often feels like songs are being constructed on the hoof, with clear rhythmic sections and repetition, resulting in a fairly instant payoff for the listener while retaining plenty of room for spontaneity (Let’s Dance is a good case in point). The disc walks a thin line between freedom and structure, managing not only to maintain its balance but also create improvisations that are very, very accessible. What’s more, the choice and ordering of the material seems to have been done with accessibility in mind – the listener is given a chance to become immersed in the music before some of the more challenging sounds and passages occur. In other words, this is a well-constructed album, a coherent listening experience. How refreshingly traditional – dare I type the words “crossover appeal”? I have a much-prized 3-LP set, “La Ciudad Secreta – The experimental sounds of Barcelona 1971-1991” (Munster Records) and the mood of loose experimentation in some of Zer0deConducta’s music (e.g. the swirling psychedelic eddies of Sweaty Bougainvillea) is reminding me of some of those recordings, linking back to the past history (is there any other kind?) of improvisation and experimental music in the city. Nice.